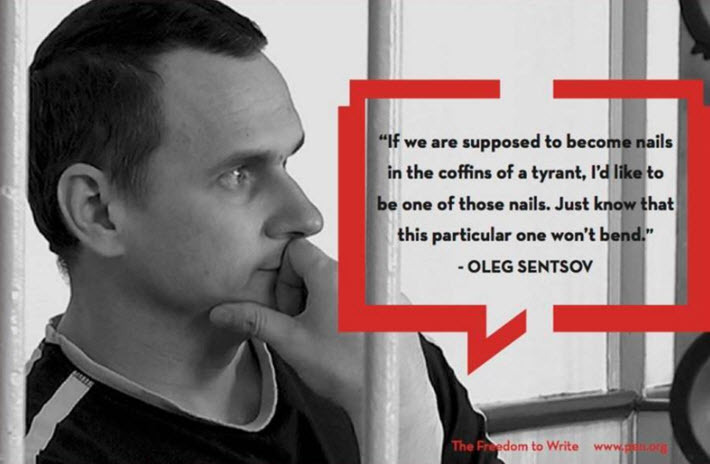 An especially lustrous group of authors, journalists, and activists has signed a letter to Vladimir Putin, conveying from PEN America a demand for the release of Oleg Sentsov, the 2017 recipient, as Publishing Perspectives has covered, of the PEN/Barbey Freedom to Write Award. Sentsov, the Ukrainian filmmaker, has been imprisoned in Russia for more than four years. the start of the Russian-hosted World Cup on June 14 will mark a month since Sentsov began a hunger strike (May 14) in Prison Colony No. 8, the so-called “Polar Bear Prison” for its location above the arctic circle. In her article at The New Yorker today (June 4), Masha Gessen writes, “Hundreds, perhaps thousands, of people in Russia and in other countries are counting the number of days that Oleg Sentsov, a Ukrainian film director incarcerated in Russia, has been on hunger strike. The letter to the Russian president, dated Friday (June 1) has among its signatories Stephen Sondheim, Art Spiegelman, Patrick Stewart, Colm Tóibín, Calvin Trillin, Scott Turow, Anne Tyler, Chimamanda Adichie, CNN’s Christiane Amanpour, Kwame Anthony Appiah, Margaret Atwood, Paul Auster, Rosanne Cash, Michael Chabon, Sandra Cisneros, JM Coetzee, Teju Cole, Michael Connelly, Claire Messud, Rick Moody, Paul Muldoon, Herta Müller, Eskinder Nega, BJ Novak, Susan Orlean, George Packer, Gregory Pardlo, Robert Pinsky, Francine Prose, Jonathan Lethem, Janet Malcolm, Colum McCann, Ian McEwan, Jay McInerney, and Victoria Redel. “As Russia prepares to host the World Cup in the coming weeks,” the letter reads, “the eyes of the world will be on the country. “Sentsov’s campaign will rightly draw attention to the injustice of his detention and that of dozens of other political prisoners in Russia. He has told his lawyer he is willing to die to bring global attention to his cause. Sentsov, born in the Crimea, was detained there in May 2014 and sentenced to 20 years in a Russian prison on charges of terrorism on August 25, 2015, in what appeared to many as a politically motivated case in retaliation for Sentsov’s outspoken criticism of Russia’s annexation of Crimea. Media messaging from PEN recounts how appeals against the original verdict were rejected by the Russian Supreme Court in November 2015 and June 2016. A request for Sentsov’s extradition to Ukraine was denied in October 2016 on the grounds that he had become a Russian citizen upon the annexation. “It’s very hard to feel like a person when you’ve lost the most important thing to you. “The people who are dear to you are not always those that you see every day. But children, even other people’s children, even those that you meet one time, will always be dear to you. But as Gessen writes in her New Yorker piece, it may take more concerted action to persuade the Kremlin to act.